How you treat your dog as a puppy will determine the kind of adult he will become. These sessions are designed to help you through all aspects of rearing your new addition & covers all typical puppy problems you are likely to encounter. Areas covered include socialising, toilet training, chewing, mouthing / play biting & any other worries you may have. Whether you want to train your dog yourself, have me come & train him for you or a combination of the two, get in touch. From basic obedience to a more advanced level, show training, trick / fun training or simply concentrating on his manners or behaviour in general, my kind methods are guaranteed to produce a well trained dog that genuinely enjoys behaving himself! Training packages are offered in 6 or 12 session courses, are designed by you, the owner, and are held at your own premises, or at a location of your choice (subject to area). A small and personal boarding facility with only a handful of kennels ensures that your dog is happy and stress free during his stay with plenty of one on one time. 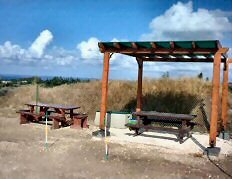 Each kennel has its own personal outdoor run / play area and prices include food and minimum 2 walks / 2 off lead runs in the large fenced in play area every day. And run by an experienced and qualified behaviourist and trainer you can guarantee that your dog is in the best of hands with all characters and conditions catered for. For friendly dogs they can play and interact with other friendly dogs, but we can also cater for anti social, elderly or overly nervous dogs too in our purpose built dog runs. Prices: All prices include food and minimum 2 walks per day. Subject to terms & conditions and availability. Large family pens also available for larger breeds or families with multiple dogs. Please get in touch for a personalised quote. Even big dogs can get up some speed! 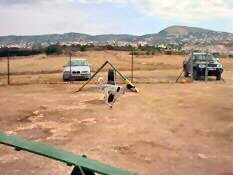 For those of us who are worried about snake bites, traffic and poison, or who have a dog that is unreliable off lead so you're unable to give them a proper, invaluable off lead run, now for hire is a fully enclosed and secure exercise / play area in Tala, Paphos & Episkopi, Limassol. Prices are based on 1 hour's usage of the exercise area and can be shared between friends if desired. Don’t have the time to train your dog yourself? Or would just prefer to send him to a professional to do the job for you? Bring your dog to K9 Solutions and leave the rest to me. The week's programme consists of a basic obedience package of sit, lie down, stay,recall (coming when called) and leave, which I train with food thinking about poison. It also covers a 'good manners' package, such as not pulling on the lead, not jumping up, not pushing past you and being polite around other dogs. But what your dog learns during this time can also be dictated by you, the owner, so that your dog only learns the things that are important to you and your lifestyle. I can also deal with behaviour issues such as mouthing, snatching or stealing food, possessive aggression. etc. whilst your dog is resident with me. €250 for one week's stay which includes housing fee, food, 3 walks per day and the training programme. Many of you have a great interest in dog psychology and dog training and spend many an evening watching the Dog Whisperer, Its Me Or The Dog, Dog Borstal and the like. These programmes are great entertainment but for the person who genuinely wants to learn about dogs and learn to understand or train their own dog better then they're not so helpful as they're edited with entertainment in mind. What I aim to achieve with my seminars is to produce an interesting and educational two hour programme covering a variety of popular themes. You don't have to own a dog to attend, you may just have a real interest in learning more about what makes Man's Best Friend behave the way they do. There are 3 seminar options covering 3 different subjects, which I've detailed below. 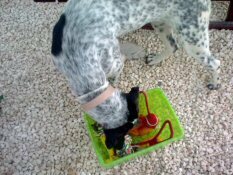 - Help to identify illnesses in your dog. Puppy Power - This seminar covers everything from choosing the correct puppy, right through to teething and everything inbetween, including typical problems such as toilet training, chewing and socialisation. Useful to anyone thinking of getting a puppy or who already has a pup up to 4 - 5 months of age. An Introduction To Canine Psychology - In this seminar you will learn, amongst other things, how your dog perceives things, how your own behaviour can affect your dogs, spotting and dealing with dominance and how to become the leader of your pack. Useful to any dog owner with a dog of any age, breed or behaviour problem. An Introduction To Training - For those of you who are interested in the training side of things, but can't seem to achieve what you want, this seminar covers the psychology behind training your dog, different methods and training tools to use and many tips on training both obedience and tricks. The seminars are held in Paphos. They are approximately 2 hours long. Each seminar will be capped at 10 places so book early to avoid disappointment. All seminars are €25 per person, per 2 hour seminar, with the exception of the Health Seminar which, due to the increase in overheads of my having to bring in a professional to run this for me, the cost will be slightly more than the other seminars, at €40 per person. All seminar prices include a pack for you to take home relevant to the seminar you're attending and a discount voucher for future use. GROUP CLASSES - BEGINNERS, INTERMEDIATE & ADVANCED OBEDIENCE, AGILITY, FLYBALL, RALLY OBEDIENCE, DUAL HANDLING & HEELWORK TO MUSIC COURSES - Please see 'Group Training Classes' for further details & prices. GIFT VOUCHERS - An unusual gift idea for any of your dog loving friends and family. K9 Solutions gift vouchers can be for the amount of your choice so the recipient can choose their own service or specifically for a particular service, such as enrollment in the agility course. A clever and useful gift idea. K9 Solutions offers a complete service for you and your dog. If there is a service that you require that isn't mentioned on this website, please get in touch to discuss further either by phone on 97 660 530 or by email to k9solutions@emailcyprus.net . If it involves your dog, K9 Solutions can help you!